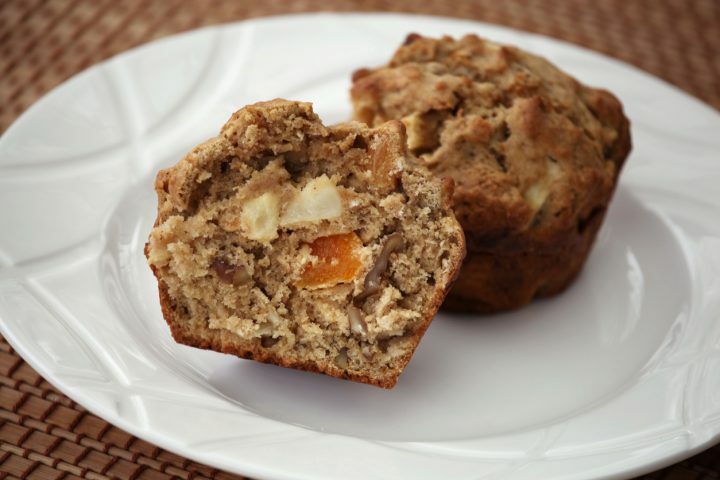 The fruit content of these wholemeal muffins keeps them very moist. These muffins are best eaten warm but will keep in an airtight container for up to 5 days or frozen for up to 6 months. Warm before serving in a microwave or wrap in foil and heat in the oven for 5 minutes. Pre-heat the oven to Gas Mark 5/190C. Line a 12 pan muffin tin with paper cases. Chop the apricots. Place half in pan with 100ml water and simmer for 15 minutes. Place remaining ingredients in a bowl. Add apricot puree and mix well. Spoon the mixture into cases and bake for 35 – 40 minutes until golden brown and firm to the touch.